This entry was posted on September 26, 2013 by Randall Hertzler. Today we deploy a new feature at kathekruse-usa.com - quick and easy access to a new products listing. Fall is a typical time for us to add new items in preparation for the 4th quarter and the holiday shopping season. 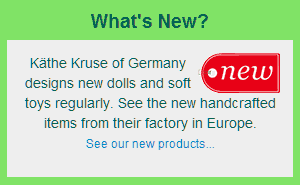 Now you can quickly discover them by visiting https://kathe-kruse.eurosourcellc.com/new-products. Or look for the block shown here in the center of the home page near the bottom. Products remain on the list for a period of 90 days so you have plenty of time to explore and discover the new designs coming out of Germany.